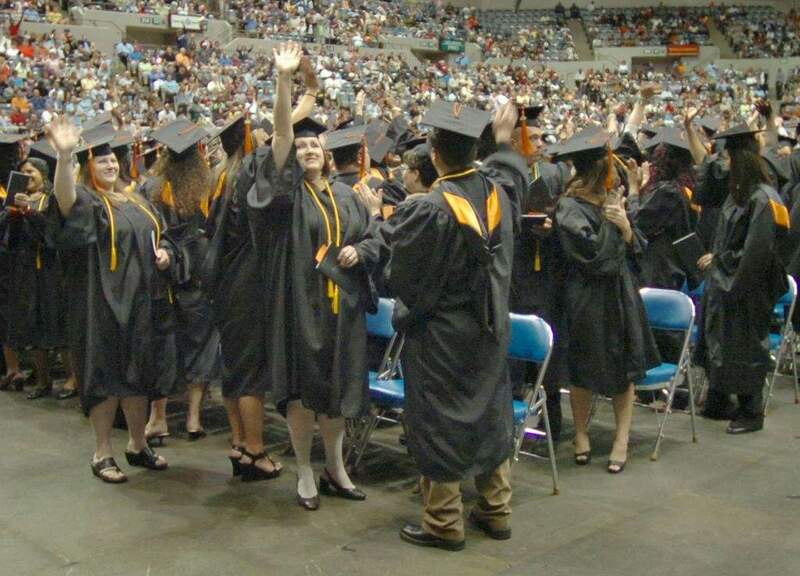 FILE: Indiana Tech graduates show their appreciation to friends and family members during commencement exercises. Forty students are enrolled in Indiana's Tech education programs, which cover elementary education, physical education, special education and secondary education in mathematics instruction. Engelhart couldn't immediately provide enrollment by grade level. Indiana Tech told students about the situation Monday, Engelhart said, noting the university is helping them understand their options. “That's what our focus is going to be,” Engelhart said. Students – and parents – aren't happy. Tammy Yorkovich – a self-described “very upset mother” – repeatedly called the university Tuesday to get answers. Her daughter, a junior studying elementary education, has dreamed of becoming a teacher since an educator at Haley Elementary School “lit the fire underneath her,” Yorkovich said. She doesn't know what her daughter will do now. “It's all up in the air,” Yorkovich said, noting she is especially fed up because her son was affected by the university closing its law school in 2017. “We'll figure it out,” she added. Indiana Tech isn't giving up on its education programs. “We're so proud of our graduates who are out there teaching now,” Engelhart said. The School of Education previously was approved under preconditions to pursue national accreditation with CAEP. The university plans to reapply for state-level approval in the fall and remedy issues identified by the accrediting agency, Engelhart said. The hope is to again seek accreditation for the worthy program, he said. The University of Saint Francis and Trine University are among 13 Indiana universities with programs accredited by CAEP. Indiana Tech failed to meet standards in four categories, according to CAEP's website.